This nail rejuvenator is one of butter LONDON's all time favourite products! 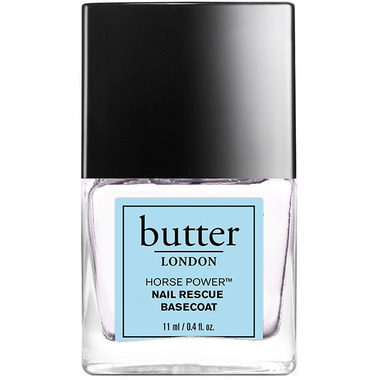 Butter LONDON Horse Power Nail Rescue Basecoat is 3 Free, and uses an herbal ingredient called ‘Horsetail’ to strengthen and repair nails. When used properly, the results are really quite staggering! Directions: Apply one coat every day for 7 days, then remove and begin again. Use for one month. Butter LONDON Horse Power Nail Rescue Basecoat can be used as both a basecoat and topcoat. Long lasting, prevents my weak nails from peeling and barely any scent. A visible improvement in nail health, strength and length after one week. I am using this product strictly as a nail strengthener, not as a top or base coat. It stays on for a long time without chipping or peeling. I usually apply another coat every 4 or 5 days. I have noticed that my nails are definitely growing longer, so I'm excited to see how my nails look after using this for a few months. My nails have been damaged over the years from constant nail-polish use and a few shellac experiences. They are brittle and peel often. I have been using this product for a few weeks now and have seen a very small difference. I am using it as advised, but you shouldn't expect any immediate changes. Still on the hunt for a better "treatment" and nail-polish! It looks very nice on nails by itself, very easy to apply, and lasts a reasonable amount of time. I wear it alone and it gives my nails a beautiful look. I have weak nails and my nails seems to have improved. I also had nails that were chipping badly. I have been wearing this polish for a week and used it as both a base and top coat. My nails have stopped flaking and, furthermore, I have not experienced one chip! Two thumbs up! Wow, this stuff works! I had nails that peeled very badly, Butter London sure put a stop to that! Highly recommend this product!